In Desolation Sound, you can drop your hook amongst a cadre of boats in a popular anchorage, or stern-tie in one of hundreds of nooks and have it all to yourself. We were anchored at the head of VonDonop Inlet on the northwest corner of Cortes Island. While hiking a trail connecting this Inlet to nearby Squirrel Cove, we chatted with a fellow boater. Intending to stay a day or two, he was still there after a week. When I asked what he’d been doing all week, he replied with a smile: “Just relaxing in my own little corner of paradise.” Although there were a couple dozen boats anchored in the 3-mile inlet, he was still able to find a secluded nook to call his own. Back on board after dinner, the soulful sound of “Amazing Grace” wafted across the water, emanating from a solitary bagpiper on a nearby boat. An appreciative round of applause punctuated the darkening sky — a perfect end to another memorable day. “Desolation Sound” is properly defined as the 30-square-mile area lying south of West Redonda Island known as Desolation Sound Marine Park, BC’s largest. 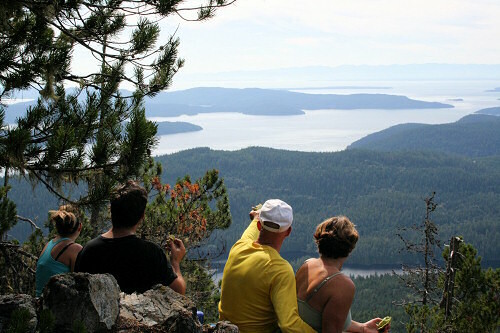 However, most boaters consider Desolation Sound to be most of the 300 square-miles of mainland, islands, and waterways shown on Navigation Chart #3538, extending west to east from Cortes Island to the British Columbia mainland, and north to south from Redonda Islands to Hernando Island. Quadra and Read Islands on the western edge of Desolation are within another cruising area called the Discovery Islands. In addition to Desolation Sound Marine Park, this premier cruising ground has six other marine parks: Hathayim (encompassing VonDonop Inlet) and Mansons Landing on Cortes Island; Teakerne Arm, Walsh Cove and Roscoe Bay on West Redonda Island, and the Copeland Islands just north of Lund. Most boaters entering the Sound from the south will transit Thulin Passage, “The Gateway to Desolation,” between the Copelands and the mainland. When Captain George Vancouver named these islands “Desolation” in 1792, he was less than enthralled with the dreary, wet weather and lack of inhabitants. George should see it today! Boaters travel from all over the northwest to experience its sun-drenched islands, spectacular mountain vistas, protected anchorages, quaint villages and welcoming hospitality. Summer months are busiest with mostly light winds while May and September are less crowded with more moderate winds. The off-season months of October through April tend to be cold, damp and windy, more suitable to a handful of intrepid boaters who prefer their scenery with solitude. Occasionally during the summer months, southeast winds and waves fetching up the Georgia Strait require hunkering down. Fortunately, a number of well-protected anchorages are close at hand. Cortes Island, largest of the five major islands, has VonDonop Inlet, Gorge Harbour, Squirrel Cove and Cortes Bay. On the mainland within Desolation Sound Marine Park are Grace Harbour, Prideau Haven and Tenedos Bay. Marinas and government docks also become busy during serious blows: Refuge Cove and Gorge Harbour marinas are within Desolation while Lund, Campbell River and Heriot Bay marinas are on the fringes. 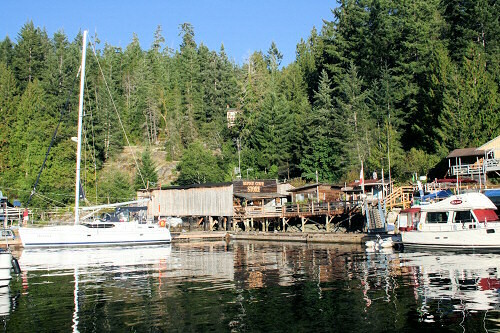 Government docks are located at Whaletown Harbour, Mansons Landing, Squirrel Cove and Cortes Bay, all on Cortes Island. Spend a week or more in Desolation and you’ll likely need fuel, water, groceries, beverages, a mechanical part or perhaps a restaurant meal. No worries; you can get almost anything you need at or near the marinas and government docks mentioned. More extensive marine services, including pump-out stations, are available in Lund and Campbell River. Fuel is available in Refuge Cove, Lund, and Campbell River. Garbage can be deposited, for a fee, at Refuge Cove, Gorge Harbour, Heriot Bay, Lund and Campbell River. One charming seaside restaurant with outside deck seating is the Laughing Oyster located in Okeover Inlet on the mainland. A small public wharf is available for the first few lucky boaters; latecomers can anchor overnight in settled weather, just north of the wharf. Several major charter companies are ideally located on the doorstep to Desolation: Island Cruising at Saratoga Beach on Vancouver Island has the closest base to Desolation, just 10 nautical miles from Cortes Island. Cooper Boating has a base in Powell River on the mainland about 25 miles south. Desolation Sound Yacht Charters in Comox on Vancouver Island requires a 35-mile crossing of the Georgia Strait to access Desolation. Further away but also offering charters to the Desolation area are Nanaimo Yacht Charters in Nanaimo and Blue Pacific Yacht Charters in Vancouver. Each of these companies offer a wide selection of power and sail boats, and have nearby shopping, restaurants and accommodation. To explore Desolation, we chartered a new 45-foot centre-cockpit Hunter from Island Cruising. After meeting friends Ray and Robin from Powell River and Ron and Michelle from Vernon, we shopped for groceries in Comox, then drove 20 minutes north to Pacific Playground Marina. “Pinch me!” Robin exclaimed when she first saw the Barlow Rose. “I can’t believe we’re going to be spending a week in such luxury.” In addition to spacious staterooms with ensuites, our yacht featured roller-furling sails with electric winches, electric flush toilets, a chart plotter with overlaid radar, microwave, generator, and suitable tankage and storage to reflect its “passage-making” capabilities. Early September provided seven days of sunshine and enough wind to sail a relaxed pace at least part of each day. Within two hours of departing the marina, we were securely anchored in a quiet bay on the east side of Mitlenatch Island on the southwest corner of Desolation Sound. This designated Island Nature Park provides a patchwork of trails through wildflowers and berry bushes to rocky outcrops from which we observed the protected seabird colony. Back aboard, we watched dozens of seals lazing on nearby rocks watching us savour our gourmet lunch. Robin loves to cook, which worked out fine because the rest of us love to eat! Our week consisted of anchoring overnight in some of the more popular harbours and stern-tying for lunch in unnamed nooks. Our primary interests, besides sailing, fishing, crabbing and oystering, were hiking and swimming. In preparation, I obtained information from the Internet about various hikes in Desolation. “The trail that never ends” and “Quite strenuous, our third attempt” are some of the comments recorded in a logbook at the top of Llanover Mountain, 698 metres, on West Redonda Island. Two hours up is the hard part but the view at the top is worth the effort. “Wow!” A majestic panorama of islands and waterways opens up below with the snow-capped mountains of Vancouver Island in the background. Allow at least five hours, take lunch and a camera, sit on the rocks and marvel at the splendor of Mother Nature at her best. Make sure you find this viewpoint by continuing on the flagged trail about 30 metres past the rock cache. The trailhead for this hike starts a quarter mile from the head of Roscoe Bay. Another great hike, more like a stroll in comparison, is Whaletown Creek Commons. The trailhead is off Whaletown Road about a half-mile west of Gorge Harbour Marina. Shoulder-high ferns, a cedar bench, babbling brook and small waterfall are a few of the attractions along a myriad of well-maintained trails in a dense forest. A slightly more vigorous 2-mile hike meanders from Melanie Cove to Unwin Lake and another from VanDonop Inlet to Squirrel Cove. The latter trail starts near the head of the Inlet and ends at a blacktop road. A lack of signage had us questioning: should we go right or left to get to Squirrel Cove? Our keen navigational skills, honed by years of coastal cruising, prompt us to go right. After a half-hour of serious trudging, we flagged down a passing motorist, who informed us Squirrel Cove was the other way! Well, we did come to hike…. Inviting fresh-water lakes are located near many of the popular anchorages. 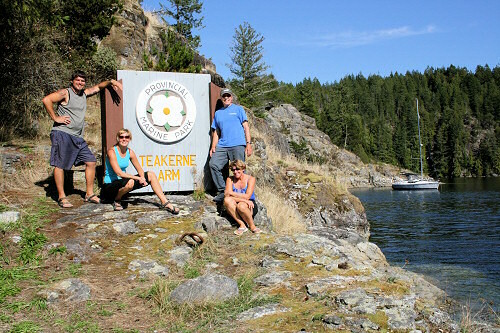 Our favourite was Cassel Lake in Teakerne Arm on West Redonda Island. A trail from the dinghy dock leads uphill a short distance, past 30-metre high Cassel Falls, to the clear, clean waters of the lake. Ropes are provided for hauling exhilarated bodies up the gently sloping rock face along the shore. 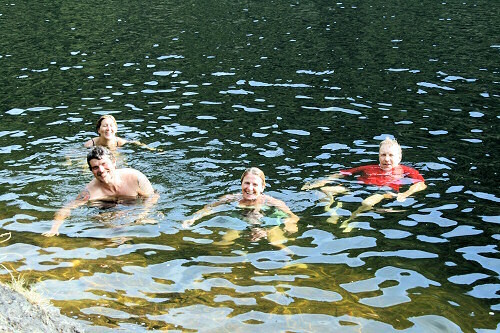 Black Lake, also on West Redondo Island, is just a short stroll from the head of Roscoe Bay, conveniently located for those who return from “the trail that never ends” and wish to cool off. Flat rocks allow easy access to the crystal-clear water and when warmed by the sun, make ideal tabletops for a picnic lunch. Unwind Lake, on the mainland, is most easily accessed from Tendedos Bay by following a half-mile creek-side trail that divides, allowing access to either side of the lake. Skinny-dippers are most likely to be found on the north side. Continue past the floating logs on either side to find suitable rocks for accessing the relatively warm water. A half-mile trail at the head of Grace Harbour on the mainland heads to an even warmer lake. As you approach this unnamed lake, be sure to take the left fork of the trail, which leads to a flat rocky area at the water’s edge. The right fork leads to a mucky shoreline. You’ll feel like Muskrat Willy when swimming out to open water through a channel amongst the lily pads. Back near the trailhead, try to locate the freshwater shower, a plastic jug fed by a hose, which provides the perfect anecdote to onboard water rationing. As with all good things, our week came to an end. After a relaxing lunch stop at a sandy beach on Hernando Island, we returned to Pacific Playground Marina with our souls replenished and our memory banks overflowing, vowing to return soon to our own little corner of paradise.